The Majlis course at the Emirates Golf Club in Dubai is the Grand Dame of golf in the UAE. It was the first course to be built there in the area in 1987. At the time there was nothing around in but desert - now it it is surrounded by the city. That makes for some dramatic backdrops to holes (none more so probably than the iconic tee shot on the 8th hole) but actually the city itself doesn't really impinge on the course. At Yas Links for example we were aware of the building work going on all around us, or the roars from Ferrari World. Here the cityscape was more of a unique tableau to play in front of. We played the course just three days after the Dubai Desert Classic was held here. The players had praised the quality of the course, saying it was the best it had ever played and the greens were the fastest they had ever seen on the European Tour. While the greens had probably slowed down a little by the time we got there it was certainly presented in immaculate condition. The rough was absolutely brutal - we found ourselves looking for balls that we had great lines on from the tee but almost impossible to find when you go to the second cut. The greens were very slick but incredibly true - there was a real grain on some of them though and needed real attention not to be caught out. This review needs to be taken in the context of the condition in which we played it. This review from Darius Oliver indicates that at other times of the year the rough is not a factor and the greens are tamer - it would definitely make it a different beast, although still a good test for us mere mortals. This course was a different class to both the Earth course where the Race to Dubai is held and Abu Dhabi National. You knew when you were playing it that you faced a real test on every hole and errant tee shots were likely to be punished severely. That may have been because of the championship set-up of the course but if you went just 5 yards away from the fairway you were in hack-out territory and the sand even further out wasn't a hard pan a la Earth course but instead a punishing sand capable of playing like a greenside bunker. Choosing the right tee is an absolute key at the Majlis Course. It has been extended over recent years so the back tees measure 7,300 yards - the middle tees at 6,500 were fine for us - we were going into greens with a good range of clubs on all pars and you didn't feel overwhelmed by the length. There is a good interactive guide to the course here and there's a youtube walkthrough below as well so I won't go through the hole by hole guide. What I would say is that there is a real good variety here - whether it's direction of hole, length of hole, water in play etc. There is nothing overly tricked up about the course either - everything is in front of you and there are not real surprises out there. In terms of holes to look out for the 7th/8th/9th is a great run. 7 is a lovely par 3 over water before the famous drive on 8 which even if you successfully navigate the desert leaves to with a tough uphill shot to an undulating green. The 9th is a par 4 which plays tough - even the best drive leaves a nerve-jangling approach over water. The back 9 is another good test and the last two holes are particularly notable - the (almost) reachable par 4 17th (even I got within 40 yards of the green before sculling one through the back and ending with a double!) and the 18th which like 9 requires an approach shot over water - whether for your 2nd or 3rd! After the round the restaurant and terrace were a great area to have a few drinks and a bite to eat and the facilities here generally were as good as anything you will see around. The driving range and putting green were excellent and the pro shop really well stocked. All-in-all we had a fantastic time here. Among my group there was some discussion as to whether this was a 17 or 18 but I have gone for a very high 17. At the end of the day I think that is was the condition of the course and fantastic backdrop that will stick in the mind the longest, rather than the golf course architecture. That's not to say you won't enjoy it here, it would be hard not to, and if you get the chance to play it you would be crazy not to! You can book the course at dubaigolf.com who manage all the times for here as well as Dubai Creek and the Faldo course. They also were able to book the Earth Course for us so are good people to know! I actually booked the whole thing online but it was a bit of a faff so you would probably be best just emailing them or phoning them - contact details below. The course is playable for non-members every day but you should try and book in good time to get the tee time that you want. This was an expensive green fee - 1250 Dirham (£260) although there are some last minute offers and off-season the price comes down a little. Given the cost this is one of those occasions when it may be worth getting a quote from an operator to see if they can do you a good deal - see below. Also worth noting that this is a walking only course in the winter months - this suited us fine but may not be to everyone's taste but they can probably organise caddies with enough notice. Unlike other tours tips this is a bit more of a travelogue for the trip we undertook which in many ways worked out really well. 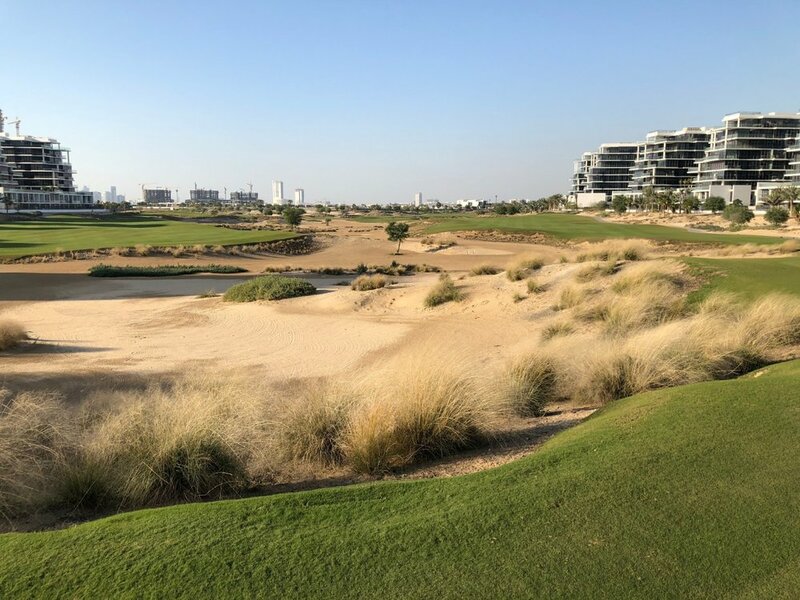 We decided to do it in style so played the best courses that were open at the time in the area - 2 in Dubai (Emirates and Earth) and 2 in Abu Dhabi (Yas Links and the Abu Dhabi Golf Club). Yas was the only course of the 4 which we played which is not on the European Tour but was probably the best. They do play a pro-am every year while the 'Desert Swing' is on and I dread to think how much someone pays to assemble what is an amazing field of the best in European golf. We decided to go and play around the time of the European Tour being in the area. The logic being that a) the courses would be in great condition b) we could watch a bit of professional golf and c) it was a good time to get out of the U.K.
We flew in from London on the Friday night of the Dubai Desert Classic and arrived late into the airport. It was relatively easy to get through and then into our hotel. We stayed at the Marriott Harbour Suites hotel which was a great find. You can book 2 or 3 bedroom apartments for the price of a hotel room which was really well situated for the golf as well as next to the Palm and several great restaurants. On the Saturday we watched the Classic - a really great day. You get very close to the players, there is no problem getting around the course to watch every shot and the atmosphere was great - access was almost like at an exhibition. After the golf we went down to Abu Dhabi. It's about an hour in a taxi and costs around £40. One tip is to rent an official taxi - not a hotel car which will cost you twice as much. And don't do as we did and grab a random car off the street. We discovered that they are hard to trace when you leave your passports inside and this is not a forgiving country when it comes to passport loss.....). We cashed in a bunch of Marriott points and stayed at the Ritz Carlton in Abu Dhabi which was stupidly grandiose - a real folly. It was huge, and empty. Don't get me wrong, the design was incredible but there was no-one there and I can't imagine it ever having any sense of soul whatsoever. Suited our purposes fine though! The first day we played at Abu Dhabi Golf Club - the one with the eagle behind the 18th green - which was a great first round. We then went out to a fantastic meal in Zuma before playing Yas the second day. Something we had not totally appreciated (but became quickly obvious) was that there is no culture, no centre, nothing really at all to either Abu Dhabi or Dubai. They are merely hotels and shopping centres connected by highways. Our taxi drivers were almost all awful. In Abu Dhabi the guy taking us to Zuma had only just arrived from Nepal and without our Google Maps we would never have got there. You would never go there for a cultural trip clearly but fortunately we were there for golf. The third round was at The Earth course (via many, many, many lost passport stops) which had a lot going for it for me (29 points took the money by some chalk) but frankly won't live in the memories forever. There will be many who tell you that a golf trip to the UAE will be relatively calm and you won't be able to drink too much. Well we did more than well on the drink front, stayed out late and basically had a perfectly fine time. Just don't be stupid in public seems to be the sensible advice. So having done all that we just went to a 'normal' restaurant this night, it wasn't really normal as the pavement outside appeared to be literally paved with gold and the service was impeccable but as it was not part of a hotel it didn't serve alcohol and the food was a fraction of the cost of other places we had been to - we ate like kings for less than £20 a head. Therefore, my advice would be if you are not a drinker then leave the hotel and go to a restaurant instead - you will be much better off! We returned to the Majlis, scene of the last round of the Dubai Desert Classic, for our last round. Playing it only 72 hours after the last round of the event was an amazing experience. The course was set up phenomenally and to play a course in such a condition was something well worth doing. The last night was a trip to Nobu in the Atlantis Hotel at the end of the Palm. It was something of a luxury but if your budget stretches to it then I would suggest you try it. There was a nightclub there which kept us going for a while before a couple of hours kip and off to the airport and home. Clearly you could truncate this by taking off the day watching the golf. The weather was great, no need for rain gear and early-mid 20s, the mornings and evenings weren't even cold and it was perfect golf weather. The flights to Dubai (or Abu Dhabi) cost about £310 and we went in early February. The green fees for these course was £800. We didn't have to pay for hotels as we did them on point but you could stay in comfortable 4 star hotels for £400 each for the week. Drink was very expensive and food not cheap so I reckon you would need to budget £60 a day at least (the sky is the limit). All in all then it would not be unreasonable to expect it to be £2,000 for a week's trip all in. That makes some of the tour operator's trips look quite appealing. For example, golfbreaks.com has some interesting looking deals and had we not been sorted before for accommodation it may have been one of those occasions when going with an operator was worth considering.